In my previous article in the winter 2016 issue of ArcUser, "The ROI Mind-Set for GIS Managers," I emphasized that the purpose of a GIS return on investment (ROI) effort is to discover and communicate the value that GIS (and you) deliver to your organization. I mentioned that there may be many GIS professionals who have reasons for not spending time on ROI studies. One of those reasons could be that they don't know where to start or how to do ROI. 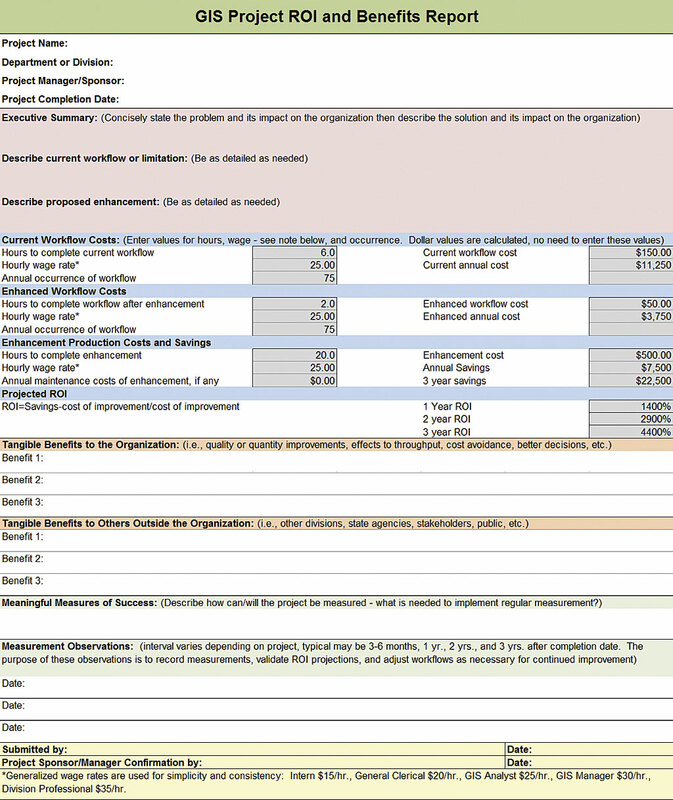 This article addresses that very issue: how to get your organization started documenting ROI. Let's first consider: who are you documenting ROI for? The audience for your ROI results are the people that made the choice to invest in your GIS program whether it was to start or continue it. Let's also include the people who review your performance. Before delving into the nuts and bolts of defining GIS value, let's look at two pivotal books on the subject. I want to give credit where credit is due. These are essential references for understanding GIS, its management, and its ROI. I often find myself pondering some core GIS principle only to discover these authors have already "gone down that road" and then drawn a map for the rest of us. The first is Thinking about GIS by Roger Tomlinson. While Tomlinson's book does not focus specifically on ROI, he explains many core components of GIS success that naturally spill into ROI as easily as rivers flow to the ocean. The ROI journey that I am asking you to consider does differ from these books in a significant way. After reading these books, a GIS professional could likely conclude that that ROI documentation requires a costly, mission-critical project or new GIS program, a team of people to research and document, and the dedication of a good portion of a year to produce a complete report. It's no wonder few GIS professionals raise their hands when asked if they measure their GIS results. Perhaps, if we change our assumptions about GIS ROI and our approach to it, we could convince more GIS professionals to document their work and its impact on their organization. Our goal at DNR was to create a one-page GIS ROI report. The report's information needed to be fairly simple to collect and include information relevant to our organization. As a government agency, we are often asked for efficiency measures, so we knew we needed to hone in on business workflows and how GIS projects affect them. 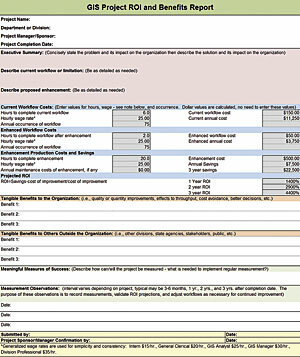 We asked our finance and HR teams to help us create/validate a simple way to document workflows and other measures critical to our department mission. The GIS ROI Report is fairly self-explanatory. However, there are some points worth mentioning. We encourage our staff to write compelling executive summaries to ensure that the business impacts are well understood by those that may not take the time to fully examine a project's finer details. The workflow costs/savings are calculated fields, so the math is automatically worked out. DNR believes it is important to document the specific measurements of GIS project success to get staff thinking about what it takes to track project performance and then take the actions needed to validate assumptions and results over time. We ask that all GIS ROI Reports be confirmed by a project sponsor or staff manager so that the assumptions and information collected can be vetted by management. Our hourly wage information for various staff levels is suggested so that the collection of salary information is not an uncomfortable/inappropriate situation for GIS staff and helps ensure consistency across the department. In my next article, I will share some specific examples of DNR's GIS ROI and Benefits Report and summarize what we have learned from using this abbreviated ROI Report over the past two years.